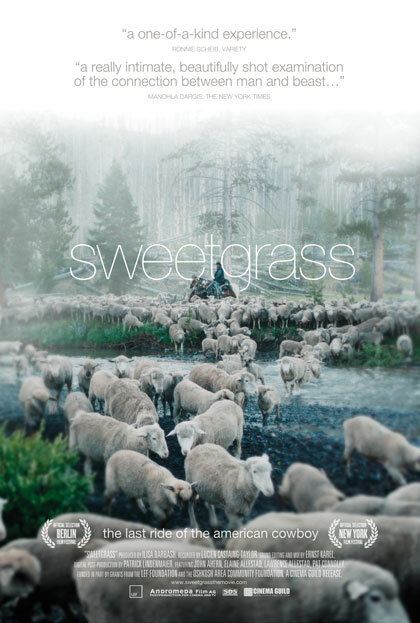 For a good 20 minutes or so, Ilisa Barbash and Lucien Castaing-Taylor’s experiential documentary Sweetgrass appears to be predominantly about sheep. As if a dark, barnyard version of Maya Deren and Alexander Hammid’s The Private Life of a Cat (in which we witness the rich day-to-day life of an average housecat from its perspective), Sweetgrass at first presents a “sheep’s eye view” of the milestones in a sheep’s life, from shearing to childbirth. The empathy we feel for these animals is extraordinary, immediate, and somewhat difficult to pinpoint the source of, as no obvious cinematic trick is employed in order to conjure it. In one scene, a farmhand moves a newly born lamb into a pen, and when she turns back to collect its mother, the sheep has disappeared amongst the flock, leaving the farmhand blinking blankly at the hundreds of identical eyes staring back at her. The effect is inexplicably ominous: through the sequence the viewer is kept anxious until the mother finally emerges to join its child. While Sweetgrass is ultimately not solely about sheep but the ecosystem of the American West—from the sheep to the dogs to the people to the mountains—this initial focus is not misleading so much as indicative of the many surprises this grand documentary Western holds in store. When the film does shift to the human beings, it’s a subtle move. The sheep gradually cede the spotlight as the filmmakers focus more on the farmers’ conversations about their daily concerns and wry jokes about the perception of their profession. These discussions weren’t absent from the film’s introduction, but they somehow seemed like background noise to the drama of the animals. After the long and arduous process of herding the sheep up into the Beartooth Mountains for summer pasture begins (a narrative basis for any number of Western films), the filmmakers further investigate their human subjects as individuals, cracking familiar archetypes of farmers and cowboys. The subjects in question are not forthcoming enough with one another for the filmmakers to depend on their verbal communication to provide insight, and, appropriately, Sweetgrass avoids conventional first-person interviews in favor of an unobtrusive observational method. The film frequently goes one step further by tweaking the relationship between image and sound—the camera will settle on impressive wide shots of the range while we listen to a closely miked conversation about pitching a tent happening somewhere off-screen, or show us the sheepherders talking while drowning out their words with the constant sound of the bleating flock. As in the film’s opening, Barbash and Castaing-Taylor’s camera placement during the herding creates unexpected effects; we seem to view events from the perspective of the impressive landscape. Throughout the physical and emotional struggles of herding, the filmmakers, often at a distant remove from their subjects, make us feel as though we’re witnessing these very human struggles from the impassive perspective of the vast and beautiful landscape they traverse. The simple effect of pairing widescreen imagery with mundane conversations proves astounding. The visible wearing down of the herders over the course of the journey finds expression in a litany of verbal abuse thrown at the sheep, dogs, and horses. This tension culminates in a moment near the film’s conclusion when we overhear one of the herders truly break down for the first time, in a phone call to his wife in which, on the verge of tears, the man describes the sheer pain of the roundup. The filmmakers wisely temper the drama of the moment by presenting shots of the mountains over the telephone conversation, giving us a shockingly intimate moment without intruding too much. Despite modern accoutrements like cell phones and industrial shearing machines, the film engages with the imagery of the traditional western, including silhouetted shots of a cowboy riding low in his saddle against a ridge at sunset, or leaning up against a tree with his hat over his face to take a nap. The men here appear as tough, stoic, and profoundly lonely we would expect from a Hollywood movie. As one of the herders asks in a so-perfect-it-could-be-scripted moment, “How can dogs like me if people don’t?” However, this image of the American icon in Sweetgrass is complicated by the slow revelation of their frustration, anger, and emotion. When the film’s closing titles reveal that this is the last time the sheep will be herded to pasture due to the farmer’s financial problems, the cowboy symbol crumbles in the face of obsolescence; a painful reality that many American economic mainstays are suffering in these difficult times. Sweetgrass, described by its filmmakers as “an unsentimental elegy to the American West,” defies conventions of both westerns and documentaries as it’s far from the wild shoot-’em-up the former normally conjures and eschews the interviews, narrators, talking heads, and, most surprisingly for a film with underlying issues of politics, industry, and the environment, the overt statement-making of the latter. The film is one of a growing movement of recent documentaries like Our Daily Bread or California Company Town that show more than they tell, and allow us to delve in and experience the issues at hand rather than dissect them from above.